Free MP3 Cutter and Editor can do simple edits to WAV and MP3 files, including volume changes, fade-in and fade-out and delete sections. Can convert mono to stereo and vice versa. Note: The program by default saves MP3 files at 128 bitrate. How to extract: Download the "Portable Version" ZIP package and extract to a folder of your choice. Launch MP3Cutter.exe. MuseTips Free MP3 Cutter and Editor is currently at v2.7.0 (changelog at http://www.musetips.com/free-mp3-cutter-and-editor-version-history.html). Only an installer is provided for downloading, but it can be (Uni)extracted and is portable/stealth. 2. The portable option has been reinstated. 3. I just wanted to snip unwanted sections; this did it simply and intuitively. I find "more advanced" editors get confusing. mp3DirectCut is a small tool for editing MPEG audio directly. You can remove parts, change the volume, split files or copy regions to new files, all without the need to decompress your MP3 into PCM/WAV. This saves work, encoding time and disk space. In addition, there is no quality loss to edited files. Functional in Linux via WINE. How to extract: Download the self-extracting EXE and extract to a folder of your choice. Launch mp3DirectCut.exe. Multiple files can be dropped. Limit track time option for Batch. Gain change detection on cutting. Volume slider in text button layouts. There is a new version of mp3DirectCut- 2.21, but I do not like the new icon and will stick to mp3DirectCut 2.20. I do not get it why all developers embrace the ugly and unbearable M$ flat design. In v2.22 there's a 'Configuration Storage' setting under Prefs>Folders. By default it's unchecked. Does it need to be enabled for portable use? The new "flat" design with similar monochrome icons is a step back in usability. Normal appearance, apart from grouping of toolbar buttons, can be restored under Configuration -> Layout. The program is a good tool for trimming old MP3 encodes without incurring further quality loss. Glitches are avoided if the MP3 is upconverted to 320 kbit beforehand with MP3Packer. I wish it also supported common simple video soundtrack formats. Mp3splt-gtk is a utility to split MP3, OGG, and native FLAC files without any change in quality. The program is useful to split albums into tracks, or cut silence or unnecessary audio data, or make audio files easier to transfer. 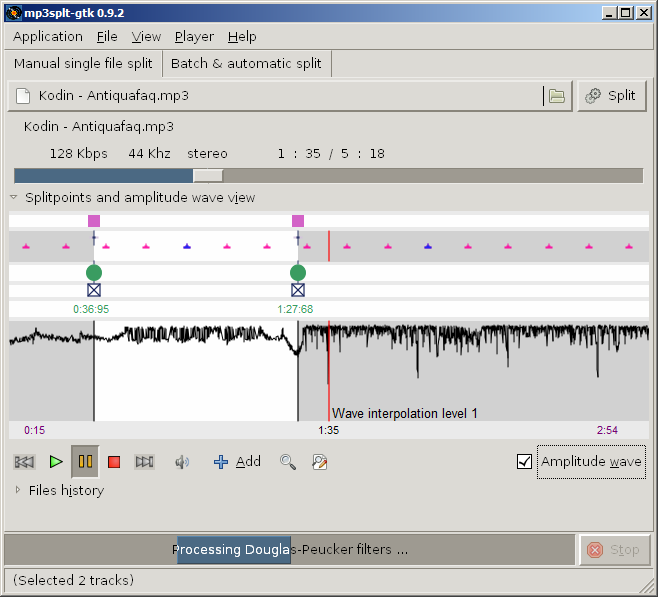 Mp3splt-gtk Portable is is a portable version of the program. Alternatively, X-Mp3splt is also available. How to extract: Download the self-extracting EXE to a folder of your choice. Launch Mp3spltPortable.exe. 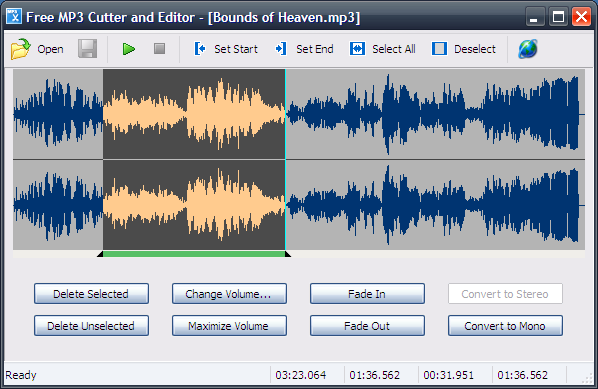 Audiobook Cutter splits large MP3 audiobook files into smaller ones without re-encoding. The split points are determined automatically based on silence detection. The split files are easier to use on mobile MP3 players because of their smaller size, and their duration allows smoother navigation. Note: As recent versions have turned into nagware, I have made a copy of the last freeware version for direct download. Please email me if you have more recent freeware versions of the software. How to extract: Download the ZIP package and extract to a folder of your choice. There are two versions for download: Win95/98/ME/NT and Win2K/XP/Vista. Launch AudiobookCutterFE.exe. Stick with version 0.75. It's really free. It ain't fancy, no bells and whistles, but it works. Version 1.4 demo is crippled and completely useless. BTW when you start up v0.75 answer "NO" when it asks you to upgrade! yep, new demo version is useless for freeware users, but it rather works for first 10 min of any file. Anyway appreciating your "free" job, I can give you a free clue. Where is the windows 98SE compatible version? zip file, the result is You download nothing!